Kurukshetra is situated north of Delhi in the state of Harayana is considered to be one of the most sacred place for Hindus for it is here in Kurukshetra the epic Mahabharatha took place. 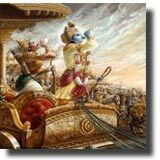 The other major significance of Kurukshetra is that it is in this battleground the holy script of the Hindus; Bhagavat Gita was narrated.Kurukshetra is also referred as Dharmakshetra which signifies justice and righteousness. This sacred place attracts lot of pilgrims and has many historically important sites to be seen. Dating back to history it was here in Kurukshetra between 2000 and 1500 BC the Aryans made their entry into this subcontinent. During this period the Rig Veda was also composed here. The supporting factors of Hinduism namely theology and philosophy was shaped in Kurukshetra between the 5th century BC and the 5th century AD. 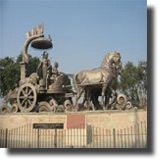 The main significance in the history of Kurukshetra is the 18 day battle of Mahabharata which took place between the Pandavas and Kauravas.Kurukshetra is referred by different names like Brajhmakshetra and Nardak where the former means the field of Brahma and the later means without sorrow. Kurukshetra in the district of Karnal of the Harayana state is situated at a distance of about 150 km northwest of Delhi. It coordinates between 29.97�N and 76.85�E. 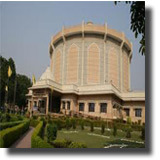 The ideal time to visit Kurukshetra is between the months of October to March. Brahma Sarovar is the celebration of the Gita Jayanti and it falls in the month of November/December. The people visit this place during Brahma Sarovar mainly to witness the Deep Daan and Aarti.Apart from this there are other cultural events like theatre performances, music recitals and pageants. Narkatari Mandir is situated near the Bhishma Kund and the legend behind this mandir is that it is here where the Pitamaha Bhishma laid on a bed of arrows created by Arjuna.Also the Bhishma Kund was created by Arjuna to quench the thirst of Pitamaha Bhishma.The moment Bhishmar told about his thirst Arjuna immediately shot an arrow into the ground and let loose a stream of gushing water. So this tank was named after Bhishmar as Bhishma Kund. 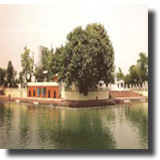 This is another sacred tank situated in Kurukshetra and is believed to have a sacred lotus in it.There is a story behind this lotus which is said to come from the home of Lord Bramha.The Lord is believed to have manifested from the navel of the lotus. Brahma Sarovar is another sacred tank in Kurukshetra which is dedicated to Lord Shiva and it is believed that it is from the land here Lord Brahma created the universe and thus civilization came into existence. A dip in this tank is said to bring all the goodness and holiness which is equal to performing 'Ashvamedh Yajna'.Gita Jayanthi is celebrated here in the month of November/December. The people visit this place during Brahma Sarovar mainly to witness the Deep Daan and Aarti.Apart from this there are other cultural events like theatre performances, music recitals and pageants. The other interesting places in the vicinity to be visited are Birla Gita Mandir and Baba Nath's haveli. 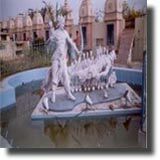 Shri Krishna Museum is situated in the heart of the town and the entire museum is dedicated to Lord Krishna depicting his life in the form of paintings. The other collections here include paintings of Patta Chitra, Kangra, Madhubani and Pichhvai; and bronze collections of Pallava, chola and Nayaka dynasty. There are quite a number of Gurudwaras in Kurukshetra.Rajghat Gurudwara the largest in the town is situated near Kurukshetra tank was built in memory of Guru Gobind Singh's visit to Kurukshetra.Gurudwara Sidhbati is the place where Guru Nanak stayed during his visit to Kurukshetra.Also in the vicinity there is another Gurudwara dedicated to the eighth Sikh Guru Harikishan. Sthanesvara Mahadev Temple is situated near Thanesar and is a very noted place in Kurukshetra for it is here where the Pandavas received blessings from Lord Shiva after their victory in the battle of Mahabharatha.The temple of Kamal Nabhi is also very close to the Sthanesvara Mahadev Temple. Sheikh Chehli Mausoleum is situated towards the north of Thanesar and it houses the tomb of Sheikh Chilhi.This tomb was built by Sher Shah Suri.Sheikh Chehli Mausoleum is built in the Mughal architectural style and the main feature of this monument is its shape which is in octagonal shape and covered with marble. The surrounding courtyard is also built in white marble. This town is named after the tenth son of Kardam Rishi, Kapil Muni. The 'Shankhya Shastra' was written by Kapil Muni. On the Karthika Purnima devotees gather near a sacred tank in kalayat. Jyotisara is supposed to be a very sacred place for Hindus for it is here where Lord Krishna delivered Bhagwat Gita to Arjun.Jyotisara is situated at a distance of about 5 kms from the Kurukshetra Railway Station. Thanesar is also known by the name Sthanvisvara and is supposed to be the birth place of the great ruler Harsha Vardhana who launched most of his campaigns here.Harsha Vardhana having Thaneshwar as his capital extended his territory Bengal to Gujarat. This ancient and sacred place of the Hindus was however captured in 1011 AD by Mahmud of Ghazni. 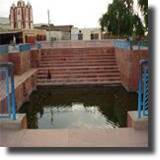 Falgu also locally known as 'Furl' is situated at a distance of about 53 kms from Kurukshetra.Legends say that at Falgu Lord Vishnu appeared on request of Lord Brahma and holy dip in the tank here takes away all the evils and brings wealth and prosperity. Haryana is known for its beautiful handicrafts which if famous in the country. The other famous items which can be shopped from here includes Phulkari" Shawls and 'Punja Durrie',Brass & Metal ware, Leather Craft (Tilla Juttis),Terracotta, Ceramics, Mudha / Basketry,Block Printed and Embroidered fabric, Wood Carving Peedha Making, Jute Craft and Carpets.